Caption: We finally made it to the top nowhere to go but down. Caption: who going to take responsibility if things go wrong? Caption: MY HANDS ARE CLEAN! Caption: Don't Blame me. If he fails give him all the blame. Caption: Dr. Vin Lawrence : "I would like to announce that, like Aubyn, Mr. Pennicook and I will also adopt the bald look. This new Air Jamaica management policy initiative is in keeping with the airline's new image." Caption: "The 3 new musketeers". Caption: The Hand of 'God'. Caption: Dr. Lawrence: In order to further reduce operational costs, si we new pilots deh! Thank yuh fi flying Air Jamaica! 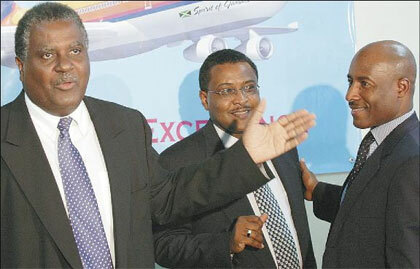 Caption: Exec.chairman, of Air Jamaica bursts into song "Fly me to the moon, and let me play among the stars!"